Buffels Hoek, an action fought on 16-17 August 1900 during the Second South African War, near Ottoshoop in the western Transvaal some 40 kilometres north-east of Mafeking. 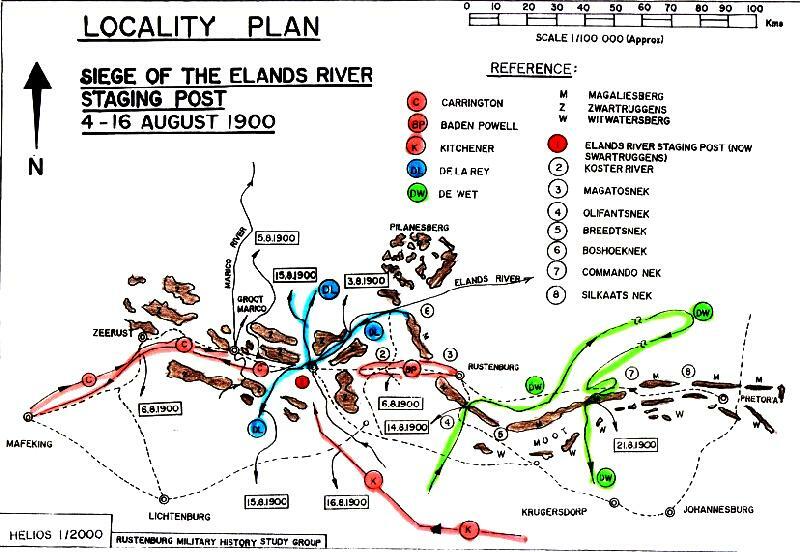 Location map detailing activity around Elands River, August 1900. Buffels Hoek, an action fought on 16-17 August 1900 during the Second South African War, near Ottoshoop in the western Transvaal some 40 kilometres north-east of Mafeking. A 1,500-strong British column commanded by Lieut.-General Sir Frederick Carrington (which included over four squadrons of Imperial Bushmen from all six Australian colonies) was ordered to advance from Mafeking to Zeerust, which he had abandoned just a week or so earlier, but was balled by a Boer force under General H.L. Lemmer holding a line of kopjes (hills) about four kilometres long. On the morning of' the 16th Carrington sent the bulk of his force forward under Brig.-General the Earl of Erroll to attempt to turn the Boer left. Several hills were taken at bayonet-point, but although weakened the Boer resistance held and the British troops were forced to spend the night in the positions they had won. The next morning Lemmer's men counter-attacked but were repulsed by mid-afternoon and withdrew from the field. 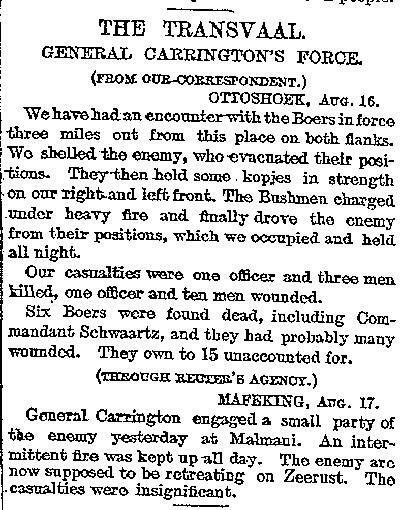 The action reportedly cost the Boers nearly 70 casualties and Carrington's force lost about 50 killed, wounded and missing. Among the latter were five Australians killed and eleven wounded. Terrain and localities of the Buffels Hoek battle. Extracted from the book produced by Chris Coulthard-Clark, Where Australians Fought - The Encyclopaedia of Australia's Battles, Allen and Unwin, Sydney, 1998, pp. 85-864. John Bufton (1905) Tasmainians in the Transvaal War, Hobart: S.G. Loone. The Times, 20 August 1900, p. 4. 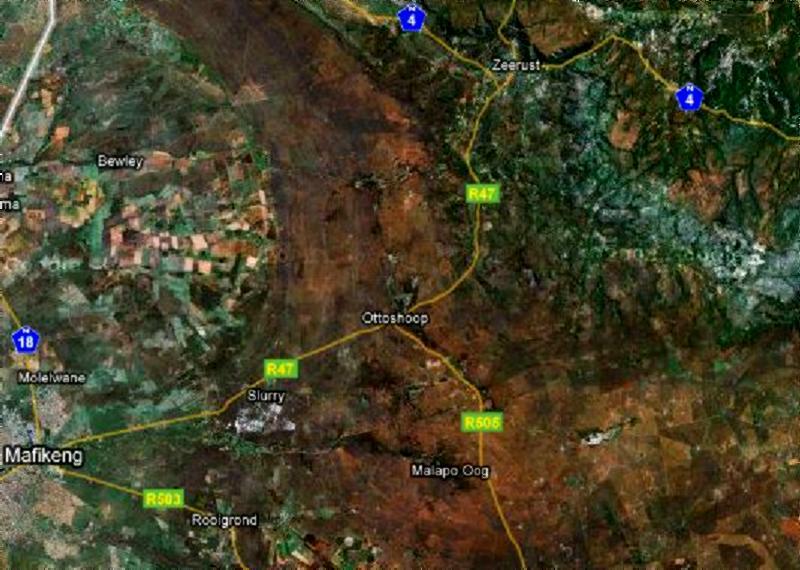 We have had an encounter with the Boers in force three miles out from this place on both flanks. We shelled the enemy, who evacuated their positions. They then held some - kopjes in strength on our right and left front. The Bushmen charged under heavy fire and finally drove the enemy from their positions, which we occupied and held all night. Our casualties were one officer and three men killed, one officer and ten men wounded. Six Boers were found dead, including Commandant Schwaartz, and they had probably many wounded. They own to 15 unaccounted for. General Carrington engaged a small party of the enemy yesterday at Malmani. An intermittent fire was kept up all day. The enemy are now supposed to be retreating on Zeerust. The casualties were insignificant. The Times, 21 August 1900, p. 3. GENERAL HAMILTON AT OLIPHANT'S NEK. Pretoria, Aug. 18, 8.35 p.m.
Carrington reports that the enemy, with which Erroll was engaged, were driven back from the strong positions they held at Buffelshoek on the 16th; one of their commanders, Swartz, was severely wounded. 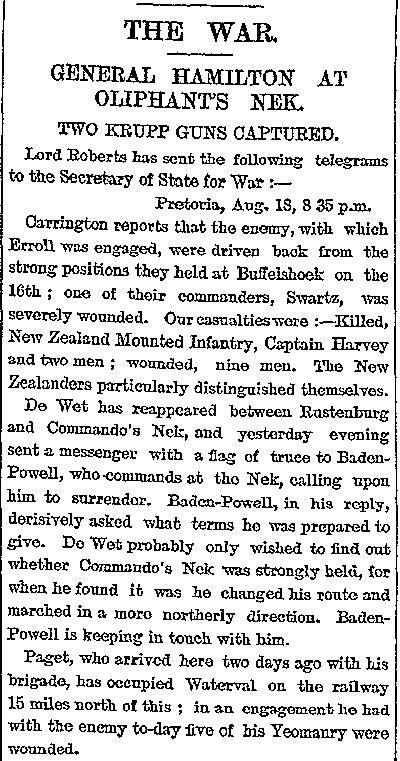 Our casnalties were:- Killed, New Zealand Mounted Infantry, Captain Harvey and two men; wounded, nine men. The New Zealanders particularly distinguished themselves. De Wet has reappeared between Rustenburg and Commando's Nek, and yesterday evening sent a messenger with a flag of truce to BadenPowell, who commands at the Nek, calling upon him to surrender. Baden-Powell, in his reply, derisively asked what terms he was prepared to give. De Wet probably only wished to find out whether Commando's Nek was strongly held, for when he found it was he changed his route and marched in a more northerly direction. Baden-Powell is keeping in touch with him. with the enemy today five of his Yeomanry were wounded.